Purpose: To use a novel approach to measure the amount of vertical marginal gap in computer numeric controlled (CNC)-milled titanium frameworks and conventional cast frameworks. Materials and Methods: Ten cast frameworks were fabricated on the mandibular master casts of 10 patients. Then, 10 CNC-milled titanium frameworks were fabricated by laser scanning the cast frameworks. The vertical marginal gap was measured and analyzed using the Contura-G2 coordinate measuring machine and special computer software. Results: The CNC-milled titanium frameworks showed an overall reduced mean vertical gap compared with the cast frameworks in all five analogs. This difference was highly statistically significant in the distal analogs. The largest mean gap in the cast framework was recorded in the most distal analogs, and the least amount was in the middle analog. Conclusions: Neither of the two types of frameworks provided a completely gap-free superstructure. The CNCmilled titanium frameworks showed a significantly smaller vertical marginal gap than the cast frameworks. Purpose: The purpose of this study was to compare patients' and dentists' perception of dental appearance. Materials and Methods: Based on internationally accepted guidelines about dental esthetics, a questionnaire was developed to measure "dental appearance" (QDA). Eleven items defined a QDA score (0 = "absolutely dissatisfied" to 100 = "absolutely satisfied"). The QDA was completed by 29 patients (21 women, 8 men) before and after a complete oral rehabilitation that included restoration of the maxillary anterior teeth. Overall, 94 dentists from four countries (Germany, the United Kingdom, China, and Switzerland) evaluated the esthetics before and after rehabilitation on a visual analog scale (VAS: 0 = "absolutely unesthetic" to 100 = "absolutely esthetic"). Results: Patients and dentists of all countries found a significant esthetic improvement after treatment (P ≤ .0001). Significant differences could be found when comparing the evaluation of the dentists from the various countries among one another and with the patients' self-evaluation (P ≤ .05). With the exception of the professional rating of the initial situation, no gender-related differences could be found in any of the test groups. Conclusions: In daily practice, it seems of utmost importance for dentists to incorporate the patients' feedback in order to avoid esthetic treatment failures. Purpose: The purpose of this study was to compare the differences in surface characteristics and roughness of teeth finished for porcelain veneer laminates using different instrumentation and to assess their influence on microleakage. Materials and Methods: Fifty-six extracted human maxillary central incisors were divided randomly into two groups: Group HsR teeth were finished with a high-speed handpiece with diamond burs; group SO teeth were finished with a sonic oscillating diamond instrument. Porcelain veneers were bonded to 24 teeth in each group. Microleakage was measured in the cervical area. Four remaining teeth in each group were examined using confocal laser-scanning microscopy and scanning electron microscopy. Results: Oscillating instruments produced a rougher dentinal surface (Ra values; P = .029) than those finished with high-speed rotary technology. Conclusions: There is less microleakage when bonded restoration edges are situated over dentin that has been finished with sonic oscillating instrumentation (P = .006). Purpose: This report describes the 3-year follow-up of clinical and radiographic evaluation of soft and hard tissue outcomes for dental implants placed in residual zygoma in patients with surgical resections. Obturator retention and support, together with a questionnaire evaluation of the patients' satisfaction before and after insertion of implants, also were carried out. Materials and Methods: A novel approach to the palatomaxillary reconstruction of eight maxillectomy patients (mean age: 40 years) using dental implants inserted into the remaining zygomatic bone on the affected side and left unloaded for 3 months is described. Ball (O-ring) abutments were used with acrylic resin soft tissue conformers after surgical soft tissue thinning above the implants. All patients were radiographically evaluated and clinically documented at regular follow-up appointments. Results: The 3-year follow-up period showed no implant failures, stable peri-implant soft tissue level, and an increase in all of the patients' satisfaction with their implant-supported obturators. Conclusions: Osseointegrated implants in residual zygomas are an integral part of oral rehabilitation strategies, with minimal cost and complications, for maxillectomy patients. This short-term record underscores both the potential of such management interventions and the importance of even longer-term clinical outcome documentation. Evaluation of mandibular movements is necessary to form the occlusal anatomical contour, analyze the temporomandibular joint status, and evaluate the patient's occlusion. This clinical study was conducted to compare the mandibular recording device Cadiax Compact II with routine intraoral records for measuring condylar inclinations. The results showed that the differences between Cadiax and intraoral records were statistically significant for all measurements. Cadiax measurements had a stronger correlation with silicone records. The quantities of recorded Bennett angles were lower and the values of sagittal condylar inclination were higher with Cadiax than with routine intraoral records. Purpose: To evaluate technical complications and failures of zirconia-based fixed prostheses supported by implants. 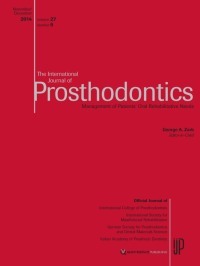 Materials and Methods: Consecutive patients received zirconia-based single crowns (SCs) and fixed dental prostheses (FDPs) on implants in a private clinical setting between 2005 and 2010. One dentist performed all surgical and prosthetic procedures, and one master technician performed and coordinated all laboratory procedures. One-piece computer-aided design/ computer-assisted manufacture technology was used to fabricate abutments and frameworks, which were directly connected at the implant level, where possible. All patients were involved in a recall maintenance program and were finally reviewed in 2012. Data on framework fractures, chipping of veneering ceramics, and other technical complications were recorded. The primary endpoint was failure of the prostheses, ie, the need for a complete remake. A life table analysis was calculated. Results: A total of 289 implants supported 193 zirconia-based prostheses (120 SCs and 73 FDPs) in 127 patients (51 men, 76 women; average age: 62.5 ± 13.4 years) who were reviewed in 2012. Twenty-five (13%) prostheses were cemented on 44 zirconia abutments and 168 (87%) prostheses were screw-retained directly at the implant level. Fracture of 3 frameworks (1 SC, 2 FDPs) was recorded, and significant chipping resulted in the remake of 3 prostheses (1 SC, 2 FDPs). The 7-year cumulative survival rate was 96.4% ± 1.99%. Minor complications comprised 5 loose screws (these were retightened), small chips associated with 3 prostheses (these were polished), and dislodgement of 3 prostheses (these were recemented). Overall, 176 prostheses remained free of technical problems. Conclusions: Zirconiabased prostheses screwed directly to implants are clinically successful in the short and medium term. Purpose: The aim of this preliminary clinical report was to evaluate and compare the clinical outcomes of immediate and early loaded mini-implants (MIs) supporting mandibular overdentures. Materials and Methods: Thirty-six completely edentulous patients (20 men and 16 women) complaining of insufficient retention of their mandibular dentures were randomly assigned to two groups. Each patient received four MIs in the interforaminal area of the mandible using the nonsubmerged flapless surgical approach. In group 1 (G1), MIs were loaded with mandibular overdentures using the immediate loading protocol, while in group 2 (G2), MIs were loaded with overdentures using the early loading protocol. The cumulative survival rate was calculated using Kaplan-Meier analysis. Peri-implant health indices (Plaque Index/Bleeding Index), probing depths, and marginal bone levels were recorded for both groups after MI insertions and 6, 12, 24, and 36 months thereafter. Results: The cumulative implant survival rates were 91.7% and 96.7% for G1 and G2, respectively. G1 recorded significantly higher Plaque Index, Bleeding Index, and probing depths than G2 after 12 months, while other observation times demonstrated no significant difference between groups. Most of the recorded marginal bone loss occurred in the first year, and no significant bone loss was noted in subsequent years. After 6 months, marginal bone loss was significantly higher in G1 compared to G2, but no significant differences between groups were noted thereafter. Conclusions: Within the limitations of this study's research design and duration of follow-up outcome analyses, immediate and early loading protocols showed good clinical results with favorable peri-implant tissue response 3 years after implant insertion. Early loading of MIs supporting a mandibular overdenture appears to be preferable to immediate loading. Purpose: The aim of this study was to investigate whether an acrylic resin-based resilient liner (ARL) could improve the satisfaction ratings of complete denture wearers. The null hypothesis was that no difference exists between the satisfaction ratings of conventional acrylic resin denture (CARD) wearers and those of ARL denture (ARLD) wearers. Materials and Methods: From April 2004 to July 2006, a randomized controlled trial was conducted at two centers, including 74 edentulous patients. Of these, 37 patients were each randomly allocated to the ARLD and CARD groups. All of the patients rated their satisfaction with dentures, including general satisfaction and satisfaction with chewing ability, speaking, cleaning, stability, retention, comfort, and esthetics. These satisfaction ratings were measured by a 100-mm visual analog scale. Perceived chewing ability of different foods, divided into five grades, was measured using a questionnaire. The mastication index (MI) was calculated for each grade. Results: General satisfaction, satisfaction with chewing, and satisfaction with speaking were significantly higher in the ARLD than in the CARD group (P = .049, .025, and .049, respectively). The chewing satisfaction with maxillary dentures in the ARLD group was significantly higher than that of the CARD group (P = .02). No significant difference existed between the MI of the ARLD (69.2 ± 17.0) and CARD groups (66.7 ± 18.7). Conclusions: Within its limitations, this study showed that the ARL improves a complete denture wearer's satisfaction ratings. This study investigated the effects of immersion of addition silicone rubber impressions in disinfectant solutions on the surface porosity of the resulting stone casts. Five brands of type 2 and 3 addition silicone rubber impression materials and one brand of type 4 dental stone were used. Impressions of a master die designed to simulate an abutment tooth were immersed in disinfectant for 30 minutes. The disinfectants used were 2% glutaraldehyde solution and 0.55% ortho-phthalaldehyde solution. The surface porosities of stone casts obtained from two brands of impression materials immersed in disinfectant for 30 minutes were determined. Results suggest that impression materials immersed in disinfectant solutions need sufficient time before pouring into dental stone. This case report describes and evaluates a method of arranging artificial teeth in patients with an abnormal jaw relationship in which a wider maxillary arch opposes a narrower mandibular arch. First, the fossa of mandibular posterior teeth was positioned on the crest of the mandibular edentulous ridge. The maxillary posterior teeth were then placed palatally to maximize occlusal contacts with the opposing mandibular teeth. Finally, acrylic resin tooth veneers were attached on the buccal surface of posterior maxillary teeth to improve the arch discrepancy. This method addresses functional considerations with the inner aspect of teeth and esthetic considerations with acrylic resin tooth veneers. van Brakel, Ralph / Meijer, Gert J. / Putter, Cornelis de / Verhoeven, Jan Willem / Jansen, John / Cune, Marco S.
Purpose: To determine whether clinical findings-bleeding on probing, pocket depth, recession, and bacterial sampling-correlate with histologic outcomes in relatively healthy peri-implant soft tissues in people. Materials and Methods: In this cross-sectional study, a convenience sample of 20 edentulous subjects received two endosseous mandibular implants each. The abutments were either zirconia (ZrO2) or titanium (Ti) (nonsubmerged implant placement, within-subject comparison, leftright randomization). Sulcular bacterial sampling and assessment of probing pocket depth, recession, and bleeding on probing were performed 3 months postsurgery. Mucosal biopsy specimens were obtained, and the blood vessel density and a score on an inflammation grading scale were determined. Results: Simple linear and linear regression models revealed that the clinical or microbiologic parameters were not associated with either of the histologic parameters. The soft tissues impressed as healthy, regardless of the abutment material. Conclusions: The peri-implant mucosa around ZrO2 and Ti abutments was considered healthy in most situations when examined histologically after 3 months but showed variation in clinical and microbiologic parameters. This report describes the use of custom-positioned vertical screws (CVS) to attach primary telescopic crowns to implant abutments. In a private practice setting, 37 patients with 40 double crown-retained implant overdentures (IODs) with a clearance fit (Marburg double crowns) were followed. All primary crowns on the 120 implant abutments were retained using CVS. After a mean followup period of 3.55 ± 1.37 years (range: 1.5 to 6.3 years), one abutment screwloosening incident was reported (incidence: 0.08%). No loosening of any of the screw-retained primary crowns occurred. CVS may represent a viable fixation concept for IODs. This preliminary study evaluated the adjunctive supporting role of diverse implant positions on stress distribution in a Class I removable partial denture (RPD) design. Nine three-dimensional finite element models were prepared to simulate mandibular RPD designs with three different loading conditions applied. Implantsupported designs demonstrated lower stress value concentrations and mucosal displacement.